Calling all master builders! You've wanted a toy building block contest for some time, here it is! Clear a spot on the carpet and dive into your favorite building bricks or blocks and create something amazing. We're looking for projects that use toy building bricks in any way. 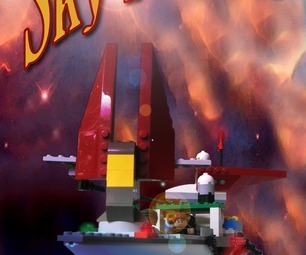 Share your epic LEGO, Kre-O or MegaBlock creation, and win some amazing LEGO prizes. Submissions can include special construction techniques to photos of a completed project. We want to see your best creations made with toy building bricks. We've got amazing LEGO prizes for the winners to keep your building skills as sharp as the pros. This contest is open to all types of *building blocks or brick*, from any manufacturer, and modified pieces are acceptable. Multiple entries are accepted, but each entrant can only win one prize. Contest is open to entries from US, Canada [excluding Quebec], UK, China, Belgium, the Netherlands, Australia, Colombia, Germany, Switzerland, Norway, India, New Zealand, and Denmark. The Contest begins at 12:00 a.m. Pacific Standard Time (PT), July 1, 2013. Contest closes for entries at 11:59pm PT, August 12, 2013. The Toy Building Blocks Contest is closed. Create a new Instructable that fits the guidelines outlined in the contest description above. To be eligible, Instructables must be published between Jul 1, 2013 and Aug 12, 2013 (11:59pm PT). Upon publishing your Instructable you'll see checkboxes for open contests. Select Toy Building Blocks Contest. If you have entries currently eligible for entry, it will also show up by clicking "Enter this Contest" on the right side of this page. Sponsor. The Instructables Toy Building Blocks Contest (the "Contest") is an on-line contest with skill, ability and knowledge components that is sponsored by Autodesk, Inc., a Delaware corporation having its principal office at 111 McInnis Parkway, San Rafael, CA 94103, USA ("Sponsor"), in connection with the Instructables service and website, www.instructables.com, (the "Sponsor Site"). The Contest is co-sponsored by the company or companies listed here, if any (each, a "Co-Sponsor"): NONE The Contest is governed by these Official Rules (these "Rules"). For any questions regarding the Contest, the Sponsor may be contacted by email at [service@instructables.com] or by mail at the address identified in Section B.18 ("Winner's List; Mailing List") below. Overview; Object of the Contest. The object of the Contest is to create an Instructables project made with any type of toy building block/brick: wooden blocks, Lincoln logs, LEGO, Duplo, Mega Blocks, KRE-O, etc. that meets the Criteria (as described in Section A.8 ["Judging"] below) and are submitted in accordance with the format, content and other requirements identified in Section A.5 ("How to Enter") below. All currency value references in these Official Rules are as indicated. Winner Selection. There will be 5 total winner(s) for the Contest. The winner(s) will be selected on August 19, 2013, and Sponsor will announce the winner(s) on August 20, 2013. Each winner will be awarded only the prize(s) for which that winner was selected, as described below. Judging. All entries that are in compliance with all terms and conditions of these Rules will be judged on the basis of the following criteria (the "Criteria"): clarity, ingenuity, creativity, quality of presentation, and execution of the Instructable. Sponsor will establish a panel of at least four (4) individuals (each, a "Judge"), including at least the following: Editor of Pertinent Category and associate editors. Two Judges from Sponsor's Instructables staff will choose 21 finalists from the pool of all eligible entries based on their preliminary assessment of whether the entries meet the Criteria. Finalists will be judged by the full panel of Judges. In choosing the winner(s), the Judges will judge each finalist on the Criteria and the Judging Process as described in Section B below. THE NUMBER OF VOTES EACH ENTRY RECEIVES ON THE SPONSOR SITE IS NOT ONE OF THE CRITERIA USED BY JUDGES TO SELECT THE WINNER(S). THE DECISIONS OF SPONSOR AND THE JUDGES WILL BE FINAL. SPONSOR WILL NOT CORRESPOND WITH ENTRANTS ABOUT THE DECISIONS OF THE JUDGES OR THE DETERMINATION OF THE WINNERS OTHER THAN AS EXPRESSLY PROVIDED IN THE RULES. Further information on the steps and process of voting and judging can be found in Section B below.